Not only did I watch my daughter graduate this past weekend, have a small party for her, run 6 miles, watch a parade, walk some more, and sail a couple hours…I also spent a whole day up north getting the cabin ready for the season. And I wonder why I am tired!?! This typically isn’t a terribly daunting task. It usually involves sweeping and vacuuming up tons of dead ladybugs. Big whoop! But this year was different. This past year several of our big trees had to be cut down because of oak wilt. That left the yard full of dead logs, branches, and brush. Unfortunately, due to a bit of a miscommunication and a broken axle on an old wagon that caused the wheel to fly off into someone’s yard, my brother Mark was unable to join us in the clean up while we were there. That left my brother Luke, my husband Paul, my son Alex, and I to do the heavy lifting and yard work. Now I have complained in the past about not being able to help the guys. This year they needed me and I complained about how heavy everything was. Nevertheless, they hear me complain every year about how strong I am when there is no work for me to do and about how weak I am when there is a lot of heavy lifting. Lol. We spent the day raking brush, picking up sticks, and stacking wood through brief sporadic rain showers. We were filthy. Then we put the dock in. I helped carry the dock to the water. The hardest part all day was putting the large raft into the water. 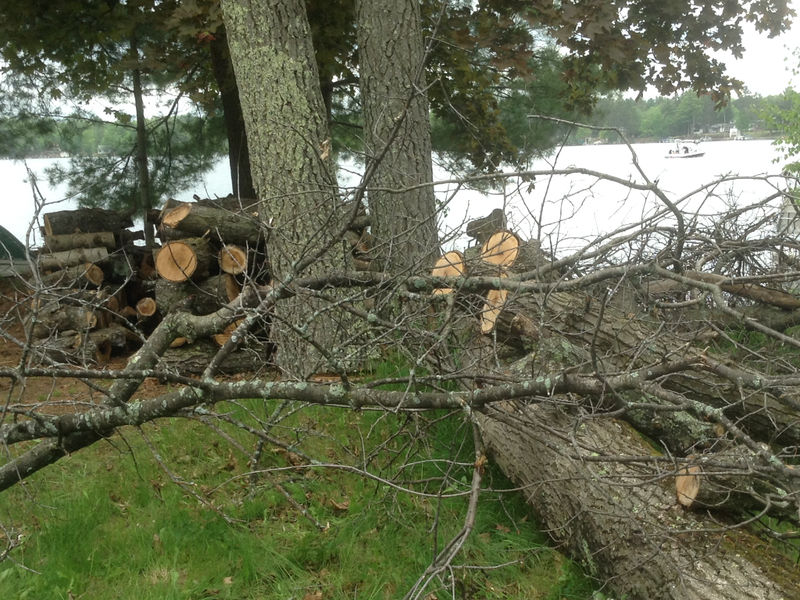 We couldn’t move the huge logs without Mark and his chain saw. So we had to tilt the raft on its side and push it in through a narrow treeless gap. Alex and I had to use our arms to hold up the raft making sure it did not tip over. After awhile my arms started shaking. There were a couple rough patches where I jolted my back. Whine, whine, whine. We weren’t even sure that we would be able to get it in the water with all of the wood in the way, but we did. Paul urged us to keep working. What a work horse! That is one of the things that I like most about Paul, he has an incredible work ethic. Not a lazy bone in his body. This weekend I am planning on going up north and swimming despite a forecast of stormy cool weather. Yesterday I signed up for my first triathlon. I felt fearful when I had to sign the waiver that promised we wouldn’t sue if this activity causes injury or death. Oh my, now what did I get myself into?? If I can run a marathon, I can do a small triathlon. Right??? I practiced the bike to running transition and this weekend I want to work on swimming. Then my plan is to put it all together. I sure hope that I am giving myself enough time since the triathlon is in a month. It has been really cold this year to go out swimming in open water. Today I biked 12 miles followed by a 3 mile run. I haven’t biked that far since I was a teenager without transportation. I found it to be very tri-ing. Lol. I had to keep repeating the same mantra over and over. I am a marathon runner. I am a marathon runner. I am a marathon runner! Imba maraphonn rrrumber….